“Curating Time’s Body: Elders as Stewards of Historical Sensibility,” in The Expressive Lives of Elders: Folklore, Art, and Aging, ed. Jon Kay. Indiana University Press. Published in October 2018, explores the role of elders in tracking multi-generational stories and shaping these into enduring worlds, bridging to common ground across modern spatial, temporal, and technological divides. 2014. “Groundtruthing the public trust: ethnography, mountaintop retention, and the reclamation of NEPA”. 36 (4): 52-54. Fall. 2013 “Edgework and Boundary Crossings: Assessing Foundations for Public Ecology in the Appalachian Region” (co-authored with Mary Hufford) Proceedings of the Society for Mining, Metallurgy, and Exploration in “Environmental Considerations in Energy Production”. Pp. 99-110. 2008. “From West Africa to West Philadelphia: Storytelling Traditions of Philadelphia’s Liberian Elders”. A Collaborative Project of The Center for Folklore and Ethnography, University of Pennsylvania and The Agape African Senior Citizens Center, Philadelphia, Pennsylvania. Maldonado, Julie, Betsy Taylor, and Mary Hufford. 2016. 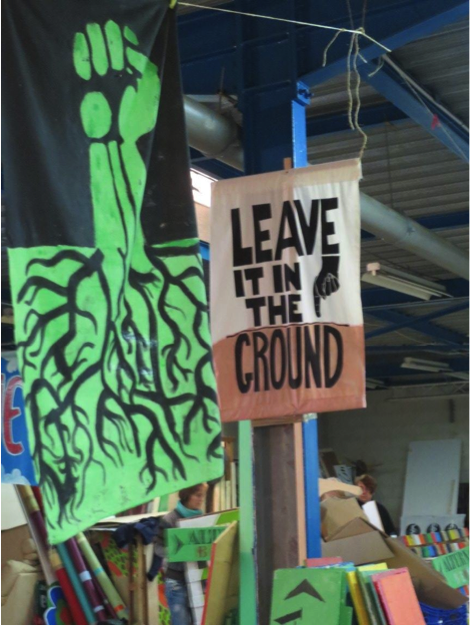 “The Livelihoods Knowledge Exchange Network: Grow Where You Are.” Practicing Anthropology, Special Issue: Activism, Agency and Engagement with Extraction, J Simonelli and S Fiske, co-editors. 38(3). Maldonado, JK. 2018. Seeking Justice in an Energy Sacrifice Zone: Standing on Vanishing Land in Coastal Louisiana. London/New York: Routledge Press. Cernea, M and JK Maldonado. 2018. Challenging the Prevailing Displacement and Resettlement Paradigm: Risks, Impoverishment, Legacies, and Solutions. London/New York Routledge Press. Maldonado, JK, R Pandya, and B Colombi, eds. 2014. Climate Change and Indigenous Peoples in the United States: Impacts, Experiences and Actions. Cham, Switzerland, Springer Publishing International. Reprinting of Maldonado, JK, R Pandya, and B Colombi, eds. 2013. Climate Change and Indigenous Peoples in the United States: Impacts, Experiences and Actions. Climatic Change 120(3). Maldonado, JK. 2016. Considering Culture in Disaster Practice. Annals of Anthropological Practice. AJ Faas, editor, Special Issue. Maldonado, JK, B Taylor, and M Hufford. 2016. The Livelihoods Knowledge Exchange Network: Grow Where You Are. Practicing Anthropology, Special Issue: Activism, Agency and Engagement with Extraction, J Simonelli and S Fiske, co-editors. 38(3). Maldonado, JK, TMB Bennett, K Chief, P Cochran, K Cozzetto, B Gough, MH Redsteer, K Lynn, N Maynard, G Voggesser. 2016. Engagement With Indigenous Peoples and Honoring Traditional Knowledge Systems. Climatic Change 135: 111-126. Maldonado, JK. 2014. A Multiple Knowledge Approach for Adaptation to Environmental Change: Lessons Learned from Coastal Louisiana’s Tribal Communities. Journal of Political Ecology 21: 61-82. Maldonado, JK, C Shearer, R Bronen, K Peterson and H Lazrus. 2013. The Impact of Climate Change on Tribal Communities in the US: Displacement, Relocation, and Human Rights. Climatic Change 120(3): 601-614. Maldonado, JK. 2012. A New Path Forward: Researching and Reflecting on Forced Displacement and Resettlement. Report on the International Resettlement Conference: Economics, Social Justice, and Ethics in Development-Caused Involuntary Migration, The Hague, 4-8 October 2010. Journal of Refugee Studies 25(2): 193-220. Hiza Redsteer, M, I Krupnik, and JK Maldonado. Forthcoming. Native American Communities and Climate Change. In Handbook of North American Indians. Vol. 1 – Introduction. Igor Krupnik, ed. Washington, DC: Smithsonian Institution Scholarly Press. Faas, AJ, R Barrios, E Marino, and J Maldonado. Forthcoming. Disaster and Climate Change-related Displacements and Resettlements: Cultural and Political Ecologies of Space, Power, and Practice. In The Angry Earth, second edition. A Oliver-Smith and S Hoffman, eds. Informa UK, Limited. Maldonado, JK and K Peterson. 2018. A Community-based Model for Resettlement: Lessons from Coastal Louisiana. In The Routledge Handbook of Environmental Displacement and Migration. R McLeman and F Gemenne, eds. Routledge Press. Bronen, R, JK Maldonado, E Marino, and P Hardison. 2018. Climate Change and Displacement: Challenges and Needs to Address an Imminent Reality. In Challenging the Prevailing Displacement and Resettlement Paradigm: Risks, Impoverishment, Legacies, and Solutions. M Cernea and JK Maldonado, eds. London/New York Routledge Press. Cernea, M and JK Maldonado. Forthcoming. Social Science Knowledge and Normative Systems in Involuntary Population Resettlement. In Challenging the Prevailing Displacement and Resettlement Paradigm: Risks, Impoverishment, Legacies, and Solutions. M Cernea and JK Maldonado, eds. London/New York Routledge Press. Maldonado, JK. 2017. Corexit to Forget It: The Transformation of Coastal Louisiana into an Energy Sacrifice Zone. In ExtrACTION: Impacts, Engagements and Alternative Futures. K Jalbert, A Willow, S Paladino, and D Casagrande, eds. London/New York: Routledge Press. Maldonado, JK. 2016. The Practical and Policy Relevance of Social Network Analysis for Disaster Response, Recovery and Adaptation. In Social Network Analysis in Disaster Response, Recovery, and Adaptation. E Jones and AJ Faas, eds. Pp. 255-268. Elsevier. Maldonado, JK, H Lazrus, B Gough, SK Bennett, K Chief, C Dhillon, L Kruger, J Morisette, S Petrovic, K Whyte. 2016. The Story of Rising Voices: Facilitating Collaboration between Indigenous and Western Ways of Knowing. In Responses to Disasters and Climate Change: Understanding Vulnerability and Fostering Resilience. MCompanion and M Chaiken, eds. Boca Raton, FL: CRC Press. Peterson, KJ and JK Maldonado. 2016. When Adaptation is Not Enough: Between Now and Then of Community-led Resettlement. In Anthropology and Climate Change, 2nd edition. S Crate and M Nuttall, eds. London/New York: Routledge Press. Maldonado, JK, AP Naquin, T Dardar, S Parfait-Dardar and B Bagwell. 2015. Above the Rising Tide: Coastal Louisiana’s Tribal Communities Apply Local Strategies and Knowledge to Adapt to Rapid Environmental Change. In Disasters’ Impact on Livelihood and Cultural Survival: Losses, Opportunities, and Mitigation. M Companion, ed. Pp. 239-253. Boca Raton, FL: CRC Press. Gonzalez, P, G Garfin, D Breshears, K Brooks, H Brown, E Elias, A Gunasekara, N Huntly, J Maldonado, N Mantua, H Margolis, S McAfee, and BR Middleton (forthcoming, 2018) Chapter 25 “Southwest.” In Fourth National Climate Assessment, Volume II: Impacts, Risks, and Adaptation in the United States. US Global Change Research Program. Maldonado, J and K Cozzetto. 2018. Gila River Indian Community Climate Adaptation and Resiliency Project: Workshop Series Summary Report. Maldonado, J, N Cooley, and K Cozzetto. 2018. Navajo Nation Climate Change Adaptation Planning Workshop: Establishing Natural Resource Priorities. Summary Report. Cozzetto K, J Maldonado, S Fluharty, J Hostler, C Cosby. 2018. Yurok Tribe Climate Change Adaptation Plan for Water and Aquatic Resources. 1 Institute for Tribal Environmental Professionals (ITEP), Northern Arizona University, Flagstaff, AZ. 2 Yurok Tribe Department of Environmental Quality (YTEP), Klamath, CA. 2017 (Lead author, Lyndsay Tarus, with co-author, Mary Hufford). “A Green New Deal for Appalachia: Economic Transition, Coal Reclamation Costs, Bottom-Up Policymaking (Part 2)”, Journal of Appalachian Studies, 23(2):151-169. Fall. 2017 (co-authored with Kendall Bilbrey, Mary Hufford). “A Green New Deal for Appalachia: Economic Transition, Coal Reclamation Costs, Bottom-Up Policymaking (Part 1)”, Journal of Appalachian Studies, 23(1):8-28. Spring. 2014 “A Journalistic Selfie: An urban reporter’s cure for rural poverty tells us more about her own bias than it does about what might work for distressed communities suffering from the ‘resource curse’”, op-ed in The Daily Yonder . July 8. The below critiques delve into various proposals that stood out to me amongst other sections of the Heritage Foundation’s Blueprint for Balance. I specifically selected the first two proposals, as they highlight a desire for US politics to become more isolationist by halting support for international organizations and projects. The last two proposals highlight a regression in society away from environmental protection for the wrong reasons. When reading these proposals I felt that the Heritage Foundation had manipulated these proposals to hide the positive and necessary aspects of environmental protection; the Blueprint instead focused on trivial and not always factual results of environmental protection. The Paris Agreement was an outcome of the 2015 United Nations Framework Convention on Climate Change Conference of Parties. This agreement was novel in that it was one of the most collaborative, far-reaching and environmentally revolutionary agreements to this date. The Heritage Foundation described the Paris Climate Change Agreement as an issue, as it planned to “initiate transformational change towards low-carbon and climate-resilient development” (Heritage 2017, 117). Curious as to how such an initiative could be understood as negative, I highlight below some issues this agreement strives to tackle. One of the main objectives of this agreement is to utilize new technology, funding and an “enhanced capacity building framework” in order to aid developing nations – the most vulnerable communities – to meet their goals (UNFCCC 2016). The agreement furthermore calls for political transparency and accountability. This means that governments and businesses will be required to abide by protocols and regulations that are in place to protect citizens, workers and the environment (UNFCCC 2016). This is important as it reduces the economic advantage for those who choose to use dirty and unsustainable production methods and increases it for those who do otherwise. Lastly, another example of what the agreement strives to accomplish is both mitigation and adaptation. This involves converting to renewable energy sources, exploring sustainable food options such as Genetically Modified Organisms and working preventative measures into political action. The Paris Agreement was a historical step that was necessary. If a superpower like the US chooses to eliminate funding and back out of the agreement, we’re refusing to act upon our moral obligations. The US is one of the largest contributors to pollution and climate change and yet by implementing this proposal (which it seems very likely Trump will do) we refuse to take responsibility for our actions. The Intergovernmental Panel on Climate Change (IPCC) is an international body at the forefront of assessing the impacts of climate change. The IPCC provides governments and the public with reliable, factual science. Climate Change is one of the leading issues of our time and to ignore it is not only selfish to ecosystems, but future generations and ourselves. The IPCC helps bridge the gap between understanding climate change and developing this knowledge into an ecological consciousness that strives to make a difference. The IPCC is composed of three different groups each responsible for diverging research, assessment and tasks (IPCC 2017). To provide an understanding on how important the IPCC is, I describe the role that IPCC’s Working Group II plays. I chose Group II because it highlights not only the environmental need to reduce climate change, but also the anthropological need. Working Group II assesses the vulnerability of both socio-economic communities and natural systems and both negative and positive consequences of climate change (IPCC 2017). Group II additionally assesses how these respective communities and systems can adapt in order to diminish adverse effects (IPCC 2017). This is merely one component of what Group II does let alone what the entire IPCC is responsible for. By cutting funding for the IPCC we diminish their ability to conduct this research and provide solutions for communities in need. Their research highlights not only moral and intrinsic incentives to save the environment, but also economic, social and political benefits. The Global Environment Facility (GEF) works with 183 countries and 18 agencies – including NGOs and several UN agencies – internationally. The GEF is one of the most far-reaching organizations attempting to make a difference in terms of climate change. This agency effectively has the ability to inspire environmental protection plans that create change on a global scale, which is imperative as issues like pollution are not confined to specific boundaries or state lines. The GEF provides necessary research, information, plans and facilities for countries and communities willing to make a difference. Furthermore, the GEF focuses on different issues pertaining to climate change, particularly problems caused by climate change. These problems include drought and food scarcity. The GEF focuses on finding solutions to these problems and making them accessible to communities in need. By cutting funding we are prolonging, if not halting, this process, leaving society with no current or future solutions in the case of climate-induced disaster. “Restricting opportunities for Americans to use such an abundant, affordable energy source will only bring economic pain to households and businesses – with no climate or environmental benefit to show for it” (Heritage Foundation 2017, 146). However, there are distinct climate and environmental benefits to show, thanks to the superfluous amount of research proving the negative impact of fossil fuels. Additional research proves that the burning of these fuels emit greenhouse gases that are harmful to human health causing issues such as severe asthma. Moreover, the regulation of greenhouse gas emissions is not prohibiting households and businesses to completely discard fossil fuel energy. Instead, these regulations often incentivize businesses to adapt more energy efficient machinery that often times allows them to save both money and energy. In terms of households, one of the reasons these energy systems are so cheap is due to government subsidies (as there are often incentives for politicians to back these fossil fuel companies), and corrupt international politics. Many repercussions will occur if the regulation of greenhouse gasses is prohibited. Some of these include an increased amount of pollution that will lead to both increased health problems for certain socio-economic communities and depleted resources for future generations. Although these are just two examples chosen from a plethora of possible outcomes they nevertheless demonstrate the dire effects this proposal could cause. As the last segment of my blog series ends, I hope that I’ve brought attention to the issues this Blueprint brings forth. I realize that this Blueprint is not the Trump administration’s actual proposed budget, but many of the proposals I discussed are very real, potential outcomes we as a society need to consider. How many of us had even heard of the Heritage Foundation’s Blueprint or took the time to read it? This year is the most involved I have been with economic, political, social and environmental issues. It’s not too late to educate ourselves and make a difference. Governments will continue to lack transparency and accountability until we take action. This action begins with us utilizing our intellect and our passion to become aware and create change. So read Trump’s skinny budget, stay up to date with legislations and bills. It’s never too late to make a difference and we have the moral and intrinsic responsibilities to do so! Heritage Foundation. “Blueprint for Balance – A Federal Budget for 2017.” Heritage Foundation, 2017, thf-reports.s3.amazonaws.com/2016/BlueprintforBalance.pdf. UNFCCC. “Science: why is there a need to act?” UNFCCC, 2016, http://bigpicture.unfccc.int/. IPCC. “Working Groups/ Task Force.” Intergovernmental Panel on Climate Change, 2017, www.ipcc.ch/working_groups/working_groups.shtml. Global Environment Facility. “About Us.” The Gef, 2016, www.thegef.org/about-us. In terms of energy pollution, the vast majority of the adult population understands the dire effects that the burning of fossil fuels has on both the environment and human health. When reading through the Energy and Water Development section of the Heritage Foundation’s Blueprint for Balance, I was shocked to see that the Heritage Foundation overlooked the scientific facts. The proposals listed below aim to outline the potential adverse effects the Heritage Foundation’s Blueprint, if followed, could have on both society and the environment. The DOE Biological and Environmental Research Program provides the research necessary to support projects acted out by the DOE’s energy, environment and other projects. This research includes understanding carbon storage, the role plants and organisms play in the carbon cycle, biofuel, etc. An example of the research this program provides is on utilizing Bacterial Protein for a more efficient conversion of Biomass into Biofuels (DOE-BER 2016). Biofuels are a widely debated topic, as they could provide a potential solution to the un-renewable energy crisis. This research provides a bacterial protein that breaks down biomass more efficiently, which in turn would make the creation of biofuels more accessible, effective and energy efficient (DOE-BER 2016). Such studies not only propel progress within the renewable energy field, but also offer alternative solutions that make the widespread use of renewable energy more realistic. Without any research in fields such as these, how will a future outside of fossil fuels be accomplished? The Office of Electricity Deliverability and Energy Reliability focuses on developing and maintaining the necessary technologies for energy and energy storage. This includes security measures in the case of a disaster, modernizing grids to withstand cyber attacks and protect energy reliability against extreme weather conditions. One example that pertains to a sustainable future and proves itself necessary is the integration of renewable energy. Projects this Office oversees include reducing peak load in order to reduce energy costs, supporting electric vehicles by providing plug-in electric vehicle operations on grids and increasing the clean distribution of renewable energies (Office (1) 2017). If the Trump administration’s proposed budget were to eliminate this specific Office some consequences could include increased prices for sustainable energies (and thus a decreased use of them), increased pollution due to increased reliance upon fossil fuels and decreased energy security. The DOE Office of Energy Efficiency and Renewable Energy is dedicated to researching and developing renewable energies that are more affordable, accessible and efficient on both a community and state-wide level. As we learn more about the harmful effects of fossil fuels, and the decreasing reserves of fuel, it is crucial to start transitioning towards alternatives. These alternatives include, but are not limited to, solar energy, wind energy and hydropower. Two particular areas this Office oversees that will affect individuals are their provision of Incentives and Financing For Energy Efficient Homes and education of the general public. In terms of the former, these financial incentives include tax credits, rebates and energy efficient mortgages (Office (2) 2017). These programs make it easier and more cost efficient for individuals to shift towards more sustainable lifestyles including solar panels, insulation and green remodeling. These specific projects not only benefit the environment; they also make energy far more cost efficient for consumers. The government currently provides oil, gas and coal subsidies so why is the Heritage Foundation so keen on removing any sustainable energy rebates? Another example is the blog the Office oversees that educates people on the harmful effects of idling cars when picking children up from school. The Office of Energy Efficiency and Renewable Energy strives to be at the forefront of creating a more sustainable society for future and current generations. By eliminating this Office we would effectively be eliminating one of our greatest fuels towards progress and, in turn, propel us further away from the ecologically conscious future we need. The Office of Fossil Energy covers a wide variety of tasks with regards to fossil fuels. These tasks include maintaining emergency fuel reserves, regulating the importation and exportation of fossil fuels and collecting data through research on the various energy sources. The Heritage Foundation stated that the Office’s extensive focus on research for technologies that reduce CO2 emissions from these sources was one of the reasons why they should be eliminated. However, this is the type of research our country requires if we are going to continue using fossil fuels in any way, as it allows for us to at least somewhat decrease their adverse effects. Two examples of important research this Office provides are the research on carbon capture and international cooperation. The Carbon Capture Program was co-initiated by the Office of Fossil Energy (Office (3) 2017). This program is devoted to researching and designing new technologies that improve the efficiency and success of carbon capturing machines that will consequentially reduce both pollution and reduce cost (Office (3) 2017). Programs like these are imperative as they strive to create technologies that benefit both those who wish to use fossil fuel energy and those who do not. The second example, international cooperation, is a larger over-arching task including various different activities. These activities include working with other countries on creating cleaner energies, collaborating globally on having energies be more secure and accessible to developing countries, and collecting international data on the harmful effects of methane and possible solutions (Office (4) 2017). International cooperation is what allows societies to progress at an expedited rate. By collaborating, we are receiving information from varying methods, techniques, environments, thought-processes, etc. This teamwork is what creates innovation, development and inspiration. It is much easier to work together than isolated, as what will we have to learn from if we cut off our connections globally? If Offices such as these are eliminated the environment will not be the only thing to suffer. As a society we require a government that is forward thinking, altruistic, and concerned with long-term issues. Forgoing a sustainable future for one still reliant upon fossil fuels will only create more chaos and issues in the future when we are left without any alternatives. We need a system that favors those who wish to make a change and choose energy sources that do not degrade our environment or our health – whether it be through rebates or state-wide shifts towards renewable energy. DOE – BER. “Publication Highlights – Bacterial Protein Shows Promise for Efficiently Converting Plant Biomass to Biofuels.” Genomic Science Program, 2016, genomicscience.energy.gov/program/berhighlights.shtml. Office of Electricity Deliverability and Energy Reliability. “RENEWABLE ENERGY INTEGRATION.” Energy.gov, 2017, energy.gov/oe/services/technology-development/renewable-energy-integration. Office of Energy Efficiency and Renewable Energy. “INCENTIVES AND FINANCING FOR ENERGY EFFICIENT HOMES.” Energy.gov, 2017, energy.gov/energysaver/incentives-and-financing-energy-efficient-homes. Office of Fossil Energy. “Carbon Capture R&D.” Energy.gov, 2017, energy.gov/fe/science-innovation/carbon-capture-and-storage-research/carbon-capture-rd. Office of Fossil Energy. “International Cooperation.” Energy.gov, 2017, energy.gov/fe/services/international-cooperation. Reading the Heritage Foundation’s Blueprint for Balance, which proposed budget guidance for the Trump administration, was like reading a contemporary political thriller novel. There were unanticipated plot twists at every corner and the whole time I was increasingly hopeful someone accidentally placed it in the non-fiction section. Although many aspects of the budget seemed unrealistic, it’s very possible the Trump administration will choose to mirror a very similar budget. When focusing on factors that effect the environment (which is much easier said than done), I found too many proposals to fit into one blog post. For this reason, I’ve decided to dedicate a series of three blogs to the Blueprint for Balance. The Heritage Foundation started their proposal by declaring its desire to halt or delay any climate progress. This proposal includes programs such as the program to regulate greenhouse gas emissions from vehicles, the Regulation of CO2 emissions from power plants and all other man-made sources, The Greenhouse Gas Reporting Program, and the Climate Resilience Fund. These programs are not only essential aspects to protect our climate, but they are also programs that attempt to hold businesses that pollute accountable. For example, the Greenhouse Gas Reporting Program (GHGRP) regulates greenhouse gas data and reports from “large GHG emission sources, fuel and industrial gas suppliers, and CO2 injection sites” (EPA 2016). This not only incentivizes companies to pollute less, but also provides guidance on how they could cut pollution without harming their businesses and how to save money by reducing emissions. Furthermore, the 8,000 facilities the GHGRP oversees are responsible for approximately 50% of all greenhouse gas emissions in the US annually (EPA). Without the GHGRP, these facilities are basically left without being accountable for emissions produced. The Regulation of greenhouse gas emission from vehicles particularly concerns every citizen, as it was instated not just to protect the environment, but also our air quality and overall health. EPA. “Learn About the Greenhouse Gas Reporting Program (GHGRP).” EPA, 2016, www.epa.gov/ghgreporting/learn-about-greenhouse-gas-reporting-program-ghgrp. The Heritage Foundation’s proposal utilized the word ‘reduce’, however I questioned the meaning of ‘reduce’ when the budget proposed to eliminate two of the four EPA programs entirely. The three projects that the budget suggested to eliminate were the ‘Air, Climate, and Energy’ research program, the ‘Sustainable and Healthy Communities’ research program and, lastly, to reject the proposed increase of $3.7 million for finalizing the “study of Potential Impacts of Hydraulic Fracturing for Oil and Gas on Drinking water Resources” (Heritage Foundation, 67). Hydraulic Fracturing as an energy source and its potential impacts is a theme that has been widely debated in recent times. Incidents such as Flint Michigan where drinking water became so polluted it was harmful to the health of locals, highlight all of the adverse affects we have yet to understand. For this reason, research in these fields is crucial, as there could be potential disasters waiting to happen we are unaware of. On the other hand, he ‘Air, Climate, and Energy’ research program is dedicated to studying the relationship between climate change and air pollution. Furthermore, this program researches innovative solutions, particularly regarding the sustainable energy sector. The ‘Sustainable and Healthy Communities’ is a research program that works directly with communities attempting to both educated citizens on local health risks and creating a more sustainable community. This includes an imperative study on the correlation between the health and well-being of Children and the interaction of chemicals and environmental stressors (EPA 2015). EPA. “Sustainable and Healthy Communities – Strategic Research Action Plan 2016-2019.” EPA, Nov. 2015, www.epa.gov/sites/production/files/2015-10/documents/strap_2016_shc_508.pdf. This proposal states “Congress should open all federal waters and all non-wilderness, non-federal-monument lands to exploration and production of America’s natural resources” (Heritage Foundation, 82). In a nutshell the Heritage Foundation is suggesting via this blueprint a retreat from sustainable energy sources towards looking for unsustainable resources like coal. This is an upsetting notion for many reasons, including the degradation of wilderness, increased pollution, decreased environmental justice, and a halt on sustainable practices. By focusing on extracting natural resources while halting research for sustainable energies, we are essentially moving backwards until we reach the point where we’ve depleted our resources and are left with no viable alternatives. In the description to eliminate EPA Environmental Justice Programs it was stated that these programs “funded projects completely unrelated to environmental justice, such as neighborhood litter cleanups; education on urban gardening, composting, and the negative effects of urban sprawl and automobile dependence”(Heritage Foundation, 78). This statement contradicts the truth of what the EPA’s Environmental Justice Programs actually provide. For example, the EPA previously released an action plan for 2020 outlining several goals. One of these goals involves hazardous waste sites and the EPA’s desire to “reduce human exposure to contamination” at these sites (EJ, 58). The EJ recognized “799 facilities and sites where human exposures to toxins are not yet under control” as of 2014. This means that a frightening number of citizens are exposed to hazardous pollutions and toxins – predominantly minorities who can’t afford the ability to do anything about it. Shutting these programs down would halt progress, leaving communities increasingly in harm’s way. Secondly, these programs that the Heritage Foundation denounces do in fact deal directly with environmental justice. Take Greenaction for example. This project educated “over 230 truckers, more than 20 businesses, two schools and one daycare center and over 2,000 Kettleman City and Avenal residents about the impacts of diesel truck idling”(EPA 2017). This project additionally encouraged nine businesses to voluntarily abide by anti-idling laws (EPA 2017). “Clean water and clean air don’t just happen, especially in low-income and minority communities. These are essential resources that we have to invest in protecting and that starts with communities, cities, states and tribes. This problem isn’t easy. We won’t fix it overnight. It’s only when we work together that we will be able to deliver these basic rights to every American, no matter who they are, where they live, or how much money they make. Everyone deserves to have their health protected from environmental exposures. “ (EJ 2016, 2). By dismantling the EPA’s Environmental Justice programs, who are we really helping and what are the real consequences? “EJ 2020 Action Agenda.” EPA, www.epa.gov/sites/production/files/2016-05/documents/052216_ej_2020_strategic_plan_final_0.pdf. In 2015 the EPA created an ozone standard of 70 parts per billion. Ground-level ozone pollution is created from the emission of nitrogen oxides and volatile organic compounds, commonly sourced from the burning of fossil fuels. Ground-level ozone pollution has many adverse health effects including severe asthma and reduced immune system functioning. The Heritage Foundation declared this reduced standard “premature action” (Heritage Foundation, 81). I believe this proposal mistook the idea of premature action with being proactive. Stepping in and stopping an uncontrollable amount of harmful pollutions is necessary, as once ozone is in the atmosphere it will continue to cause harm. Particularly with environmental degradation and pollution, being proactive is far more successful than being reactive. Once a species is extinct or the coral reefs have been destroyed there is no coming back. We need a budget and government who mirror this understanding and value an institution that acts to prevent such devastation. Although I couldn’t delve into each proposed budget cut, others in this section included the Elimination of the National Clean Diesel Campaign, End the Land and Water Conservation Fund, Eliminate the EPA’s information Exchange and Outreach, Reduce the EPA’s Legal Advice Environment Program, and to Reduce the EPA’s Civil Enforcement Program. When reading this budget it’s easy to dismiss these proposals, as the Heritage Foundation has no control over our actual budget. It’s becoming increasingly evident, however, that perhaps President Trump and the Heritage Foundation’s values are not so divergent. When reviewing Trump’s skinny budget it was hard to grasp an understanding of quite what he intends to do as it was both vague, generalized and provided zero depth. What he did make clear though was a desire to radically change the EPA and the role it plays in American society. The skinny budget mentioned a $2.6 billion cut from the EPA – a 30% reduction – which would also amount to a loss of 3,200 jobs (Office of Management 2017, 41). The budget additionally called for an elimination of over fifty EPA programs (neglecting to specify which ones) and an elimination of funds for specific regional efforts and grants (again failing to specify which ones) (Office of Management 2017, 41). After reading proposals such as these, the Heritage Foundation’s Blueprint and Trump’s skinny budget started to seem eerily similar. Office of Management and Budget. “America First – A Budget Blueprint to Make America Great Again.” The Whitehouse, 2017, www.whitehouse.gov/sites/whitehouse.gov/files/omb/budget/fy2018/2018_blueprint.pdf. Although many are familiar with Trump’s rampant threats (often unsupported and then denied), after his selection of Scott Pruitt to head the EPA (a man who sued the EPA for having harsh pollution standards), I am concerned that Trump’s statement above might have some bite to its bark. If Trump were to fulfill his desire to dismantle the EPA and slash its budget, I worry what the repercussions could be. If followed through, this threat would mean budget cuts, job losses and diminished EPA capacity. Research and fieldwork studies, such as the studies dedicated to assessing the impact of global climate change, will be greatly reduced – if not eliminated – threatening the progress of environmental preservation (Leber 2017). Grants for environmental scientists at universities and field research on environmental issues, pollution and pathways forward to reduce environmental degradation and increase community resilience would be decreased if not halted (Cornwall 2017). One of Trump’s main points of interest is to reduce the regulations and fines the EPA has placed on the oil, gas and fracking corporations (Cornwall 2017). The colossal impacts the EPA’s dismantling will have reach much farther than the realm of nature. A large portion of the EPA deals with environmental justice, particularly for low-income communities of color who carry the country’s burden of pollution. By ripping apart the EPA, a crucial component of our health and well-being, we jeopardize not only the environment, but the lives of members of frontline communities and our future generations. The Trump administration’s actions, thus far, to run EPA into the ground, highlight a president who is more willing to destroy those who protect the environment and human health, than to protect those who destroy it. There are millions of Americans who share my point of view, yet our voices are being muted by a government and media culture unwilling to hear us. We will not be muted any longer. It is time this administration hears our collective voice and what we are coming together to stand for – the health, well-being, and right to clean water, air, and environmental justice for current and future generations. Cornwall, Warren. “Trump plan for 40% cut could cause EPA science office ‘to implode,’ official warns.” Science, American Association for the Advancement of Science, 3 Mar. 2017, www.sciencemag.org/news/2017/03/ trump-plan-40-cut-could-cause-epa-science-office-implode-official-warns. Leber, Rebecca. “6 Ways President Trump Wants to Hamstring the EPA.” Mother Jones, 6 Mar. 2017, www.motherjones.com/environment/2017/03/trump-epa-budget-cuts. Team Fix. “The Fox News GOP debate transcript, annotated.” The Washington Post, 3 Mar. 2016, www.washingtonpost.com/news/the-fix/wp/2016/03/03/the-fox-news-gop-debate-transcript-annotated/?utm_term=.364cd796c472. Thompson, Jake. “New Poll Shows Americans Strongly Opposed EPA Shutdown, Look Unfavorably on Those Who Put Our Health and Environment at Risk.” National Resources Defense Council, 17 Oct. 2013, www.nrdc.org/media/2013/131017. Historically, the force of change has been social movements starting from the bottom up, advocating for laws and policies that reflect notions of justice, grounded truth, and firmly-held beliefs. These political and social changes are often fueled by younger generations who strive to create a better world for their futures. Global warming is a contemporary example of this unfolding. Many recent policy-relevant changes unfurled by the Trump administration, however, are working against this tide and attempting to shape the public into a mold of their creation – forcing change downwards. By having a governmental authority figure that strives to redefine social norms and facts, leaves the validity of government-sourced information to be questioned, perfectly exemplified by the Environmental Information Administration (EIA). Students like myself have been rallying on campuses around the world to raise awareness about the need for environmental protection and advocate for climate justice. My education and own awareness on global climate change, pollution, and environmental degradation have empowered me to act. Yet, this type of education and awareness are at risk of diminishing for younger generations – the ones who will be burdened with the destroyed environment we are creating. Just recently, the Trump administration edited the EIA’s website pages dedicated to educating children on the environment. The pages were amended to reword and omit sentences, facts and words that blatantly showed correlation between environmental pollution and the coal, oil and fracking industries (Lee 2017). Pie graphs that depicted emissions released from coal relative to the percentage of coal energy utilized by American citizens were removed and words such as “impacts” were substituted with less harsh words such as “effects” (Lee 2017). Furthermore, the following sentences were completely removed “In the United States, most of the coal consumed is used as a fuel to generate electricity. Burning coal produces emissions that adversely affect the environment and human health” (Lee 2017). The changes to the website, represent a shift away from renewable energies towards harmful energy sources like coal. Children are like sponges, absorbing the information and opinions that surround them. By removing key elements and evidence from their sources of information, their perspectives on the environment will be manipulated to fit the prerogative of corrupt industries. Biasing which ‘facts’ children are taught is not only fundamentally wrong, but it also hinders them from understanding the true severity of our environmental situation. Environmental protection will not be viewed as an imperative and most importantly those who should be held accountable will be able to continue on with business as usual. Moreover, when it comes to our media environment, we now face the issue of not knowing what is a reliable source and where to turn to for evidence-based, unbiased, and accurate information. In the past, I turned to .gov websites for reliable information. However, the recent turn of events makes me question these sites’ validity. Having a government who encourages people to espouse such illegitimate and dishonest rhetoric highlights the issue of not knowing what is evidence-based fact from opinion in today’s media. What this means is that we as the younger generation must stay politically aware and environmentally educated from a variety of sources. In doing so, we challenge those who strive to rewrite truths by acknowledging their falsehoods and holding them accountable. Lee, Patrick G. “Concern Sparked by Recent Changes to a Department of Energy Website for Kids.” Pro Publica, 17 Feb. 2017, www.propublica.org/article/childs-play-team-trump-rewrites-a-department-of-energy-website-for-kids?utm_source=pardot&utm_medium=email&utm_campaign=dailynewsletter. Over the past century, news media has been in a continuous state of evolution, accelerated in recent years by the introduction of social media. With the public virtually drowning in information from social media, news now has to elicit feelings of excitement akin to those of soap operas in order to be deemed ‘breaking’. Modern society, in large part, relies on social media to be informed about current events, however more often than not the information is not factual reporting, but rather a manifestation of opinions lacking evidence. Verification has become obsolete within the white noise of the Internet where every second thousands of individuals espouse opinionated rhetoric disguised as ‘news’. Unfortunately, the deeming of statistical proof as nonessential has leaked into our political sphere. ‘Alternative Facts’ is a concept now quite familiar to those who keenly peruse the headlines. Speeches and facts are allowed to have the statistical validity of ‘word-of-mouth’ gossip. The recent debacle of Press Secretary Sean Spicer describing Trump’s inauguration crowd as the largest ‘ever witnessed’ stirred conflict amongst civilians due to its inaccuracy (Bradner 2017). When asked about this falsehood, senior adviser Kellyanne Conway responded that it was not a lie, but rather an ‘alternative fact’ (Bradner 2017). A government that sees facts not as black and white, but as a spectrum of truths creates a detachment between the public and ‘real news’. The consequence of this is either a society where “nobody believes anything any longer”, or a society that allows itself to slip into an unconscious state, separated from the truth and apathetic towards finding it (Grenier 2017). The lenience towards sources such as tweets – or what under the Trump administration is a forum of policymaking – threatens many aspects of societal progress, such as international relations, social movements and environmental sustainability. United States’ citizens are now witnessing the nomination of environmental advisors who willingly avoid the truth to propagate their own objectives, which support fossil-fuel companies over environmental regulation. These advisors are able to do so, in part, because the truth has become so scarce. Differentiating the truth from lies has become as difficult as finding the ball in a shell game – influential people using trickery and confusion so the spectator no longer knows where the truth lies. The mainstreaming of alternative facts has created a society where people can base their careers on falsehoods, such as a member of the EPA who utilizes their power for environmental regression. To make a difference, people, particularly government officials, must be held accountable to the statements they claim to make as ‘truth’ and those who aim to report on evidence-based facts should not be name-called ‘fake news’. For us as citizens what this means is that we should continue to hold those who perpetuate lies accountable, whether it be through social media, blogs or organizations. Furthermore, taking political action by attending local marches, meetings or signing petitions that highlight the grave injustice that is censored truth has the ability to strike change. Although these measures may seem small, political action starts within the public and, therefore, change must first be ignited at the community level. 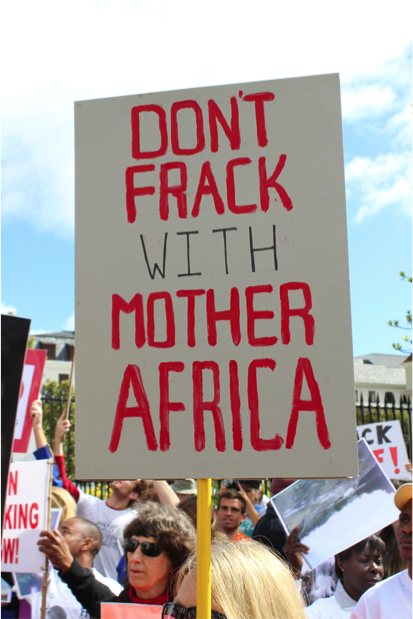 Anti-Fracking Protest – Photo by Julie Maldonado, Cape Town, South Africa, October 2012. While the expediting of the Dakota and Keystone Pipelines by President Trump made global headlines, many other important actions have gone by undetected. One important example is Representative Bill Huizenga’s bill to abolish “Section 1504” of Dodd-Frank – more commonly known as the anti-corruption rule (Grossman-Cohen 2017). Section 1504 requires that oil, gas and mining companies publish statements of their payments towards foreign governments (Grossman-Cohen 2017). The purpose of this was to decrease corruption by making governments accountable for any money given to them, as information about the acquisition of such money would then be accessible by the public. Such an anti-corruption law safeguards civilians of under-developed nations by ensuring this money goes to necessities, such as education, health care and infrastructure. The capital obtained from these “extractives operations” are in many cases “the only significant source of government revenue in underdeveloped countries” (Sibley 2017). Because of this, these operations have the ability to either aid and modernize a county, or further increase the wealth disparity between civilians and unethical elites. When looking to understand the importance of section 1504, it is necessary to see the scope of corruption and the extent to which it can be taken. An infamous case of corruption that was investigated was the dealing between ExxonMobil and the Nigerian Government. ExxonMobil was working with the Nigerian Government to renew their oil licenses at a price of $1.5 billion (Global Witness 2016). After this renewal, however, the Nigerian Government not only may have valued these licenses at $2.55 billion, but also possibly sold them at a much higher cost (Global Witness 2016). The reason they were able to do this was because no payments had been published originally (Global Witness 2016). Many big oil and mining companies have spoken out against section 1504 for several reasons. Some say they believe it will divulge sensitive information while others say it threatens their competitive edge (Morgan 2015). In actuality, these allegations are false. Some companies have even noted, “transparency makes good business sense, and is not costly or damaging to their operations in any way” (Morgan 2015). In reality, companies who want section 1504 dismissed are those that fear immoral governments will no longer want business without discretion, furthering corruption. Section 1504, and the civilians it protects, is essential. In order to defend under-developed communities from the grasp of corruption – and the poverty it brings – governments must be held accountable for their actions. The first step towards this is transparency and making government dealings and actions public knowledge. For this reason, eliminating section 1504 will only worsen the situation within developing countries meaning that we as a developed nation have the responsibility to stand up and defend section 1504. Global Witness. “Global Witness Report Sheds Light On Exxonmobil’s Questionable Dealings In Nigeria.” Global Witness, 24 June 2016, www.globalwitness.org/en/press-releases/probe-murky-exxonmobil-deal-shows-need-tough-oil-transparency-rules/. Grossman-Cohen, Ben. “Is Representative Bill Huizenga pro-corruption?” Oxfam, 24 Jan. 2017, politicsofpoverty.oxfamamerica.org/2017/01/is-rep-bill-huizenga-pro-corruption/. Morgan, Jana. “The foundation is shaking beneath Big Oil’s House of Cards.” Publish What You Pay Us, 18 Aug. 2015, www.pwypusa.org/the-foundation-is-shaking-beneath-big-oils-house-of-cards/. Sibley, Nate. “Fueling Kleptocracy: Transparency in the Extractives Industry.” Kleptocracy Initiative, 24 Jan. 2017, kleptocracyinitiative.org/2017/01/fueling-kleptocracy-transparency-in-the-extractives-industry/. 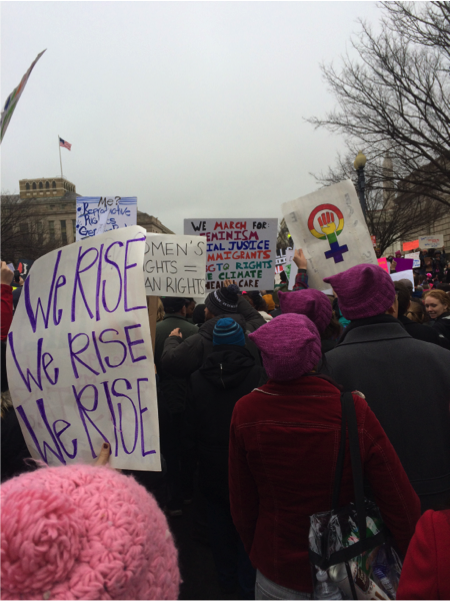 Women’s March, Washington, DC. January 22, 2017. Photo by Julie Maldonado. In the past eight years, global society has made great strides towards a more environmentally conscious international community. Just recently in 2016, 131 countries of diverging ideologies and backgrounds came together to sign the Paris Agreement to combat climate change and adapt to its effects. Yet, as President Donald Trump’s positions have been introduced over the past several weeks, the environmental progress the Paris Agreement represents seems threatened at best. Highlighting Trump’s direction for environmental policy, two particular Trump cabinet selections have ignited a spark of panic: Myron Ebell and Scott Pruitt. Myron Ebell was chosen as an environmental advisor to Trump and is part of the transition team for the Environmental Protection Agency (EPA). The concern is that Myron Ebell – a man who questions the validity of climate change – has an imperatively influential role on what path the EPA will now take. Ebell hopes to utilize his power in the EPA in order to “undo…regs that are very harmful to our economy” showing no concern for the environmental degradation our current economy creates (Fountain 2016). Instead, Ebell plans to use the EPA as a way to protect fossil-fuel industries, which makes sense as his organization is partially financed by the coal industry (Fountain 2016). Analogously, Scott Pruitt has been nominated to run the EPA, but seems to lack an understanding of the reality of climate change. Before being elected to run the EPA, Pruitt had sued the EPA a myriad of times for its ‘harsh’ regulations for pollutions, such as smog (Dennis 2017). With an influential role in the EPA, Pruitt plans to alleviate the pressure and regulations President Obama had applied to fossil-fuel companies amongst many other things (Dennis 2017). With Ebell and Pruitt both holding the key to environmental progress – or regression – it seems as if we are leaving the foxes to guard the henhouse. If Trump’s presidency has demonstrated anything thus far, it is that anything can happen. Predictions are all we are currently able to do. In the name of extrapolating, however, there is a dire future we could potentially move towards if trends continue in the current direction. 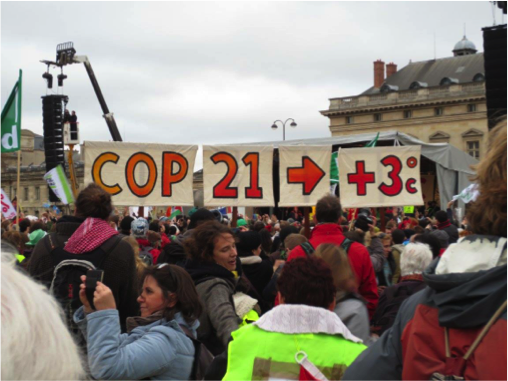 Paris – COP21, Photo by Emily Williams. Trump’s decision to expedite both the Keystone and Dakota pipelines cast aside eight years of struggle by environmental justice movements. These pipelines, amongst many other decisions of Trump, will lead to an increased reliance upon coal and oil, and the avoidance of renewable energies. Nevertheless, as the interests of big oil and coal companies (and all who profit with them) are put before our ecosystem, health and wellbeing, increased pollution is but one of many problems we face. If this trend towards a government uninterested in environmental issues continues, we risk the chance of fostering a younger generation uneducated and uneducated and unconcerned about the environment. On a grander scale, we jeopardize our role as one of the world’s leading superpowers. By going back on the Paris Agreement, alliances could be torn and threatened, creating a global society riddled with strife. Furthermore, as a world leader we should be acting as a role model. Instead we are going back on our word and possibly encouraging other countries to follow suit and to abandon collective action on this urgent global danger. In doing so, our environment will effectively continue to be destroyed until our resources are depleted and our ecosystems are run dry. On the other hand, the selection of Ebell, Pruitt and others might galvanize individuals to take progress into their own hands. Since the election of Donald Trump, protests and marches have erupted globally. When there are this many people fighting for the future of our planet and ourselves, it seems as if, although not ideal, this situation is not unbeatable. Until the future of our environmental movement is clear, however, it is important we strive to make change at an individual and community level. Dennis, Brady. “Scott Pruitt, longtime adversary of EPA, confirmed to lead the agency.” The Washington Post, Feb. 2017, www.washingtonpost.com/news/energy-environment/wp/2017/02/17/scott-pruitt-long-time-adversary-of-epa-confirmed-to-lead-the-agency/?utm_term=.5674cb1b165d. Fountain, Henry. “Trump’s Climate Contrarian: Myron Ebell Takes On the E.P.A.” The New York Times, 11 Nov. 2016, www.nytimes.com/2016/11/12/science/myron-ebell-trump-epa.html. Outside the Paris Agreement COP 21. Paris, France. Photo by Emily Williams. Having grown up in a generation where global society is accessible through the click of a button, I am concerned about recent political shifts towards isolation. Our modern lives are inescapably influenced by the interconnectedness most commonly referred to as globalization. To many, globalization is deemed a negative force supportive of only the neo-liberal leaders who fostered the economic movement to begin with. Now backlash against these partnerships that benefit a global elite at the expense of local economies and environments have emerged globally – from Brexit, to the election of Donald Trump to Italy’s referendum. Nations previously at the forefront of globalization are now experiencing contemporary nationalistic movements, striving to reconstruct the barriers global institutions fought to remove and promoting traditional borders that protect the individual from the outside. We are in danger of a political polarization between those who espouse such anti-globalization sentiments and those who fear that the new nationalisms will perpetuate bad oppositions of “us vs. them”. Many who are worried about anti-globalization nationalism, favor a kind of international interconnectedness that fosters a notion of global citizenship where all are supported. Although to many globalization is this sense of global citizenship and support, the aforementioned isolationist movements deem globalization a negative force tempered by negligent institutional governance, utilizing the middle-class as a necessary consequence. But are they wrong? How can we bridge the gap between these opposing viewpoints? As our millennial generation begins to enter the workforce, we are left at a crossroad. Do I strive to devote my career to returning a sense of promise and hope to globalization, or do I foster this growing aversion towards it? These anti-globalization movements have erupted globally for a reason and it is imperative for our generation to understand why. Over the past two decades, proponents of economic globalization have argued that it would increase prosperity and remedy divergences and stratification, especially in developing nations. However, under globalization, inequality has increased throughout the globe. Should we therefore abandon globalization, or should we restructure it? There may be no definitive answer to these questions, but we now have the opportunity and responsibility to decide globalization’s role in our future. Movements fighting for issues such as sexual, racial and social equality greatly benefited from globalization as interconnectedness. 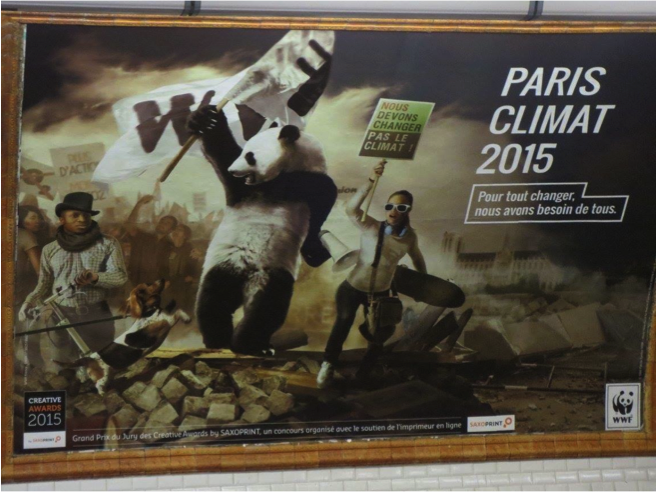 Climate Change activists have analogously benefited from globalization, as explicated by the 2016 Paris Agreement where governments of divergent cultures came together to cooperate for the greater good. Taking ostrich-like approaches and distancing ourselves from global cooperation will slow – if not halt – progress on many of these necessary pursuits of justice. What should we do in a time where governments question their role in global society? We must highlight how globalization has not only fueled success up to now, but how it can further provide our society with greater progress. Why are we suddenly fueled by a desire to protect those within our border, but not those who neighbor it? Now is the time more than ever for individuals to label themselves as global citizens rather than perpetuate the distinction between ‘us’ and ‘them’. Catastrophes, such as global climate change, do not just affect one of us, but rather they affect everyone. So, what does this mean for us, the younger generation transitioning from school to the work force? It means we should try to redefine globalization, effectively eliminating its negative aspects and enhancing its positive influence on our futures. The growing apprehension over the globalized economy does not need to push us towards total isolation from global society. Our generation can still utilize the interconnectedness of today to propagate a communal attitude towards progress. Starting campus organizations, attending conferences or simply educating ourselves on international news are invaluable first steps. Knowing the dangers of globalization should only empower us to create a more effective system that can successfully bridge the gap between the equal, just and profitable society we need, and the society we have. “…the fate of nations is intertwined, and…exclusion hurts those who are excluding as much as those who are excluded” (Solomon 2016). Opposition to interconnectedness will only hurt the societal victories modern civilization is fighting for. Solomon, Andrew. “A Perilous Nationalism at Brexit.” The New Yorker, 28 June 2016, www.newyorker.com/news/daily-comment/a-perilous-nationalism-at-brexit. 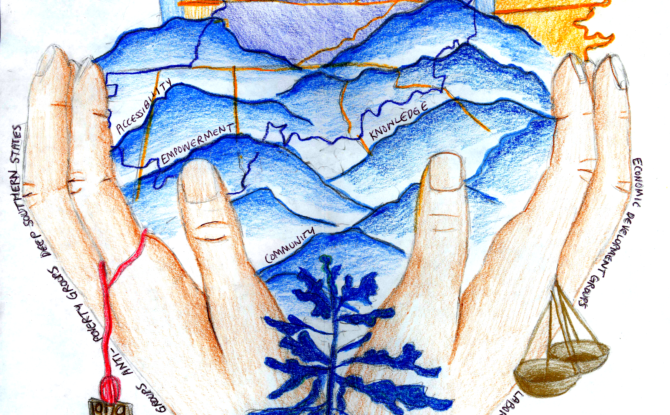 What Does Appalachia Mean to You? Community members began by introducing themselves by name along with why they loved Appalachia, starting with a letter from the alphabet. Bill Price kicked it off with, “We all love Appalachia because it’s awesome, with an A, get it?”, expressing, as did many others, how beautiful, picturesque, and inspiring this region is.to the people gathered for the first Appalachia Ownership Land Study meeting on Sept 30 in Lexington KY. Many participants gave more intimate responses that offered a peek into how Appalachia is more than just an escape from the city or a part of the backwoods stereotype. “Its shared its secrets with me”, Mary Cerillo. Each and every community member, researcher, activist, grassroots member, and organizer who has a stake in this land study inspired the artwork displayed here. Painted in the center, are the Appalachian mountains with the main components of the new land study written in the peaks to show their importance in the community taking back this region. 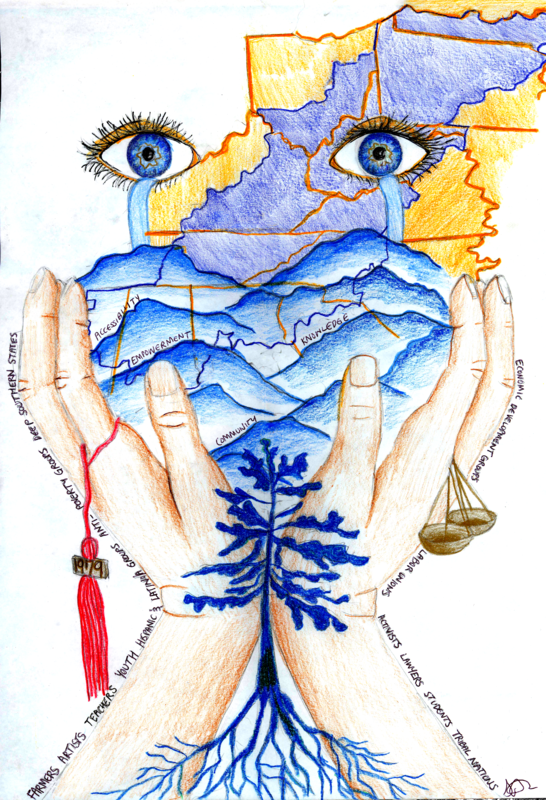 The hands symbolize the community members, as a whole, with academics (tassel) and the legal system (scales) all working together. Some groups, including labor unions, economic development groups, and the deep-southern states are written along the hands to better represent their involvement. Each member in a community should have an equal part and say in this process. The tassel wrapped around one of the fingers in a nod to the original Appalachian Land Ownership Study of 1979, because we are building upon it. In between the hands, is a pine tree that symbolizes grassroots organizations that are making a real comeback in this collective collaboration. As Carol Judy puts it, “…this is a time for grassroots academia and grassroots strategists”. Marie Cirillo discussed successful grassroots efforts where land trusts were created in rural towns, and suggested that research into the question of “why can’t community land trusts work?” should materialize. She also added that she felt like “…we don’t have a place in planning anymore”. An important step in the new land study is to establish agency for every single individual and a platform on which they can act together. The tree also symbolizes growth in the community to work together on issues (each tree branch) that were caused by the coal industry in this region. Such issues include deforestation, poverty, relocation, erosion, pollution, and exploitation of the community. Carol Judy brought up the importance of the temperate rain forest and watersheds and asked, “When does government have responsibility in broader based commons?” Davie Ransdell discussed generational leases where people may be leasing land from coal companies, but do not own the land or the mineral rights. She added that this would make records not easily available, if they even exist. Joe Childers chimed in to describe how permits can even overlap. Davie voiced her concerns over the issue of property being passed down through the generations to multiple heirs, resulting in unclear ownership and decision-making left out of the hands of landowners. Above the mountains, is a pair of eyes that shed tears not of sadness but of joy. They were inspired by the reaction of a member who attended the first Appalachia Ownership Land Study meeting in Lexington, KY; Deborah Bahr. Carol Judy turned to her to say, “…realizing the pearls of the moment” as Deborah had tears of relief from the sprouts of communal action unfolding. This is a sign of healing. This meeting is giving hope for the future and that’s what this painting is all about–healing in Appalachia and in what this beautiful region means to its people. It’s about every single Appalachian dweller taking back their home by being informed, empowered, and supported by one another. These tears are no longer tears of sadness but joy and relief that a very promising new land study is already underway and participants are growing in number. Our vision is to make data and knowledge, in general, more accessible to everyone through digitizing it in a language everyone can understand. Art is a powerful tool for advocacy and sharing knowledge. It’s also a testament to the fact that there are many routes that can be taken to spread information, to speak to the hearts of every stakeholder. One member voiced that visual and descriptive models for change are needed to accompany quantitative data. Every person has a different set of skills and background that can be valuable and open up the door to more resources that can used for this land study. This is not a process that is reserved for just professionals and academics. All walks of life and all forms of expertise are vital.